Guess everyone loves a bargain; and our Fuzu users don’t have to wait in line to get Exclusive career-changing deals! Did you know that the name ‘Black Friday’ originated from the U.S where so many people went out to shop, a day after Thanksgiving, causing traffic accidents and sometimes even violence and death? Now you do! Guess everyone loves a bargain; and our Fuzu users don’t have to wait in line to get Exclusive career-changing deals! 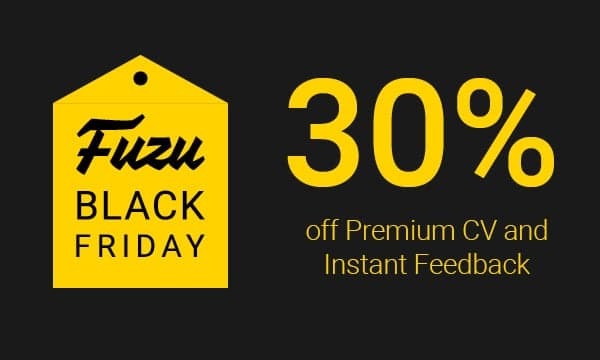 At Fuzu, we are celebrating Black Friday by rewarding you for being part of our Fuzu community and constantly engaging and inspiring us to continue supporting you in your career journey. We pride ourselves in being more than just a job board, we are your career companion. We offer you additional features like ‘Fuzu extras’: Premium CV and Instant Feedback to take your career to the next level. Once you submit your job application, this Fuzu’s Instant Feedback feature allows you to see where you rank against other applicants. You get access to the CVs of the top applicants, and also see how you compare to other applicants by experience, skills and education. Check out our Instant Feedback. Having a well-written and up-to-date CV is essential when looking for a job because that’s all employers have to see if you are the right fit for a particular role. We want you to make a great first impression, so why don’t you get take a look at our Premium CV feature and get a professional CV created by Fuzu. Check out our Premium CV. Don’t forget to share this email with your friends so they can take advantage of this offer too! Share this link so they can join the Fuzu community. Note: This offer is valid until 26th November so don't miss your chance to redeem it! Also, we have lined up more exciting gifts for you this holiday season. Keep checking your email for more! I trust am going to succeed thanks for the connections. In love with everything from fuzu, thanks guys. I'm more than glad for making part of you. I love the experience with Fuzu. I have got nothing to celebrate yet coz am unemployed. I am pleased with your good job. Fuzu? A place like no other, helping millions and billions of people to get a job..I celebrate you but still waiting to get a job through you. Much pleased with your services,hope to move on being part of you too as I advance in my career. cogratulations fuzu for the good work u are doing.continue the same way. Your comments lyk it and am hoping for the best! I thank you fuzu for grate work you have done to me. Ok.it's good idea and thanks a lot for informing me.However, I have been applying several times since last year but one but no positive feedback. What a big disappointment and discouragement this is! I Celebrate you @fuzu for being my career companion.Thank you for the information.